I Was Only 19 (A Walk in the Light Green) is one of Australia’s most iconic songs. First released in 1983, this account of a soldier’s experiences of the Vietnam War—and its traumatic aftermath—topped charts, won awards and still packs a punch some thirty years after its creation. John Schumann, songwriter from the folk-rock band Redgum, based the song on the recollections of Vietnam veteran Mick Storen. 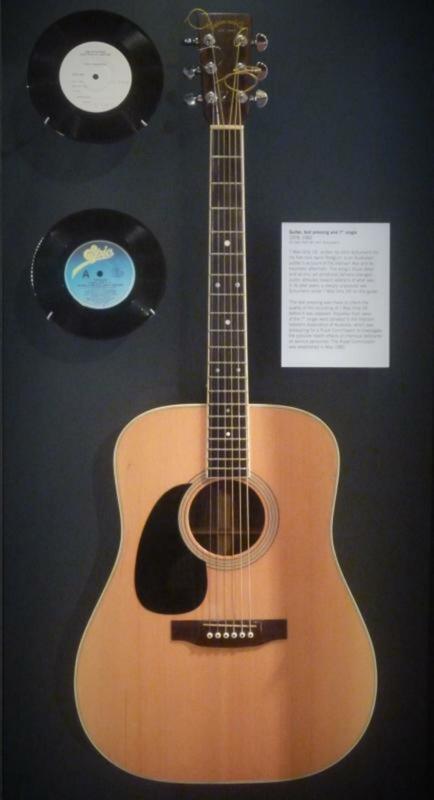 The guitar on which Schumann wrote I Was Only 19, the test pressing of the song and a 7” single are now on display in our Living Democracy gallery. Schumann donated royalties from the song to the VVAA, which in May 1983 succeeded in their quest for a Royal Commission into the effects of chemical defoliants on veterans. In 1987 a welcome home parade and concert in Sydney for veterans culminated in Schumann playing I Was Only 19. In 1992 the Australian Vietnam Forces National Memorial, which features an inscription of some of the song’s lyrics, was unveiled on ANZAC Parade in Canberra. The success and longevity of I Was Only 19 demonstrates that its veracity is difficult to ignore or forget. The song appeals to people across generations: in 2005 a cover version by hip-hop collective The Herd was voted Number 18 in Triple J’s Hottest 100 of that year. But the impact of I Was Only 19 lies not only in its personal, very Australian insights into the reality of battle. Its lyrics, challenging ‘the ANZAC legends’, is a demand for honesty rather than myth. The song’s reference to these ‘legends’ also differentiates Vietnam from earlier conflicts while simultaneously acknowledging Vietnam’s conformity with an age-old universal theme: the terror and tragedy of all war. The continuing public life of Mick Storen’s private story attests to its deep emotional resonance, and to the power of song. Cause and effect: John Schumann used this guitar to write one of Australia’s most iconic and influential songs.